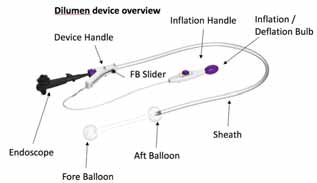 Flexible Endoscopic Double Balloon Platform: from concept to human feasibility trial. Background: Despite the clear benefits and utility of Flexible Endoscopy (FE) in the diagnosis and therapy of GI disease. Inherent limitations exist in FE design and affect the ability to perform advanced therapeutic actions effectively and efficiently. Here, we present a report of a unique add-on technology in development – a double balloon platform that adds stability and improves endoscopic visualization within existing FE systems. This technology began as a concept within the Minimally Invasive New Technologies (MINT) program of Weill Cornell Medicine / New York Presbyterian Hospital and here we report the results of the first human clinical feasibility registry study. Methods: We report the development of the double-balloon device by a two-operator team from the first human case onwards. All 30 patients were scheduled to undergo routine surveillance colonoscopy. Key outcomes (ability to reach cecum, procedure time, inflation of balloons and complications) were prospectively reported for each patient sequentially. Results: The first case was attempted in April 2017. Subsequently, 29 colonoscopies were undertaken using the device and the study ended in September 2017. In 5 patients the cecum was unable to be reached, in 1 of those patients this was not possible with the FE alone. This was primarily due to long, tortuous colon anatomy. Time to reach cecum was on average 13.4 minutes. No obvious trends were noted in other outcomes. No clinically significant complications were observed. 6 polyps were treated using the device successfully (in 2 patients). Discussion: The safety of the device was evaluated in this prospective study with no major issues identified. A 15-patient study assessing therapeutic benefits is the next step. Progress will next be made to begin a formal registry study.